In In and Down, Michael and Stephen are young brothers growing up with no female influence in their lives. Through their father's emotional absence and abuse, they come to believe women do not truly exist. One of the boys draws into himself, looking for answers to the confusion in his life, and throughout this descent, he experiences his past as though through a distorted carnival mirror. When he emerges from his inner journey, he is forced to confront a secret that has been buried deep inside for over thirty years. 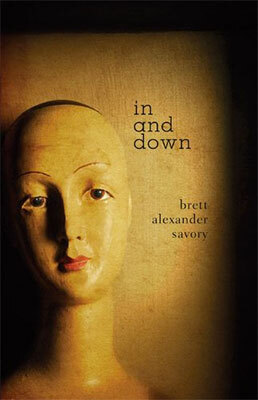 If Alice had been a boy – and her life a complete mess – then her journey through Wonderland might have been quite similar to In and Down by Brett Alexander Savory. You might have found the work of Lewis Caroll somewhat creepy (if not, read again the part when a hideous Duchess nurses a piglet while her cook throws dishes at their face for no apparent reason) but wait till you get into eleven years old Michael’s head: he doesn’t have a mother, he almost drowned once, his brother plays vicious and life-threatening pranks on him, his father is some rude, neglectful fly-eater and finally, his inner world is a vast nightmare. I’m not coming home tonight. The boy makes me uneasy. You love him. I can’t. Those are the words of a letter signed by the mother of Michael and his brother Stephen. Mother. They didn’t know they had a mother. Actually, they didn’t know women existed at all. When Michael finds this message, it triggers the beginning of a strange and scary journey into himself. 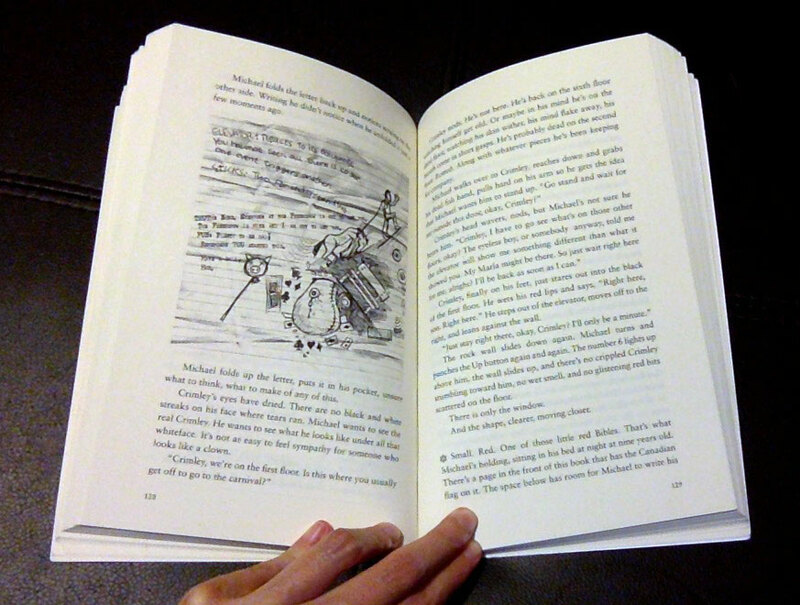 The novel switches constantly between memories of Michael’s childhood and his adventure in his horrific inner world, which encourages the reader to (try to) piece the facts together. Michael’s world – what I love most about this book – is surreal and often absurd, in the same way Alice in Wonderland is, except it’s also dark and frankly disturbing. It is centred on a derelict carnival with a single ferris wheel spinning empty wagons by itself, people walking rotten animals on leash, dead mimes attached to poles for belly-poking, and pig-shaped balloons with X where their eyes should be. The typical carnival, really. This carnival is like the one to which the boy’s father takes them. The kind of carnival where the farther in you go, the more you feel like you’re sinking into the ground. Reality falls away as lights and the motions and the noises blend into a downward spiral where you forget your name, forget what the outside world is like. But nothing is quite random: this world is a distorted reflection of Michael’s life and his relatives. For example, in his first “dreams”, he meets a mysterious young woman, the only woman in the carnival, his “chance to find someone who loves him properly”. Most of his self exploration is then motivated by the hope of finding her again. Simultaneously, in real life, he’s trying to find more letters from his mother. However, the expedition only gets darker, scarier and more claustrophobic as Michael gets deeper in himself and slowly realizes he has no control over his life. He’s not even sure who he really is. Everything sneaks away from him or dies. As more memories about his family come back in flashes, his inner world becomes more macabre and threatening. [The boy] is allowed to feel angry at everything that has happened, at everything that he has had no control over. (…) The fact that no one is as they appear to be, that they are just actors, that his life and his feelings have been scripted from the beginning of his memory, (…) that has been plotted out by a creator who has forgotten him or at the very best doesn’t care about his life, his happiness. Finally, I must say I really enjoyed the few illustrations in the book. They really strengthen the atmosphere of the book! I loved In and Down‘s originality and unpredictability. It features a fascinating, frightening and vivid world entirely based on a little boy’s traumas, which makes it even more terrifying. I really enjoyed how Michael’s exploration slowly reveal elements of his real life, sometimes clearly, sometimes in a symbolic way, and how his inner world mutates as he gets closer to the horrendous truth. You should really read In and Down if you’re seeking a gripping, smart horror novel that is definitely out of the ordinary! In and Down does sounds like a smart horror book I like to read. I’ll remember it when I need something chilling to make me think. It is! I hope you’ll enjoy it as much as I did!